Linux Mint 9 will feature a brand new version of mintBackup, the “Backup Tool”, rewritten from scratch by a newcomer in the development team, somebody people on the IRC and the forums know quite well: Ikey. Being written in Python, it’s not as fast as copying files directly or using rsync (unless you turn off the integrity checks and the checksum verifications) but it’s quite robust and it’s extremely easy to use. The software selection backup/restoration is also very intuitive and will be of tremendous help for people upgrading to a newer version of Linux Mint. With this tool, comes an entire tutorial on how to upgrade your system, the philosophy behind it, the risks, the method and answers to the most frequently asked questions. This answers a need that many people have and something that was lacking in our distribution. It’s another stance taken by our project and another philosophical difference between us and most other operating systems. Our lack of confidence in package upgrades, our policy of prevention when it comes to potential regressions and our recommendations to always perform fresh installations… all of this had to be backed by an alternative solution that would be easy and reliable to use. With this guide and this new tool we finally have what was missing. The tool was developed for Linux Mint 9 Isadora but also tested on Linux Mint 8 Helena. Together with the tutorial it will replace the traditional “Upgrade instructions” associated with each release and end the development of our in-house, yet not recommended, mintupgrader tool. As the support on Linux Mint 6 is coming to an end, many people will probably be happy to get access to this new solution. Cool! I think I will need it. Does it also handle software selctions made from external PPA’s? e.g. will it automatically reinstall VirtualBox in the closed source version? Morten: When you restore your software selection it will show you everything that you installed before and that isn’t installed in the new system. If a particular package isn’t found in the repositories it will still appear in the list, but it will be marked as uninstallable and you won’t be able to select it. 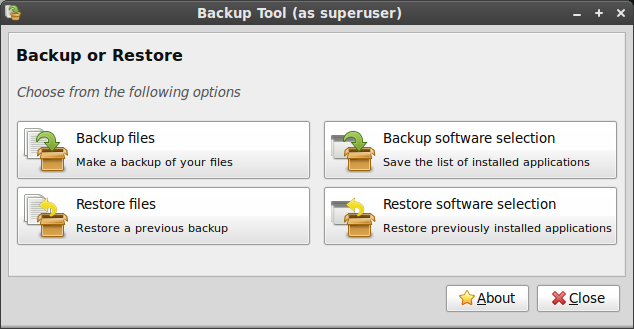 So you’ll have to add your PPA using the software sources tool and then click the “refresh” button in the backup tool. The list will then be refreshed and the package will be selectable. When you install packages with the software selection restoration, they disappear from the list, so you can reinstall everything and you’ll be left with the packages that weren’t found… that gives you the opportunity to deal with them later or one by one. The way it’s design you can run the tool over and over again, you don’t need to restore everything at once. Congratulations! It is clear that the Mint team is working to solve the real problems of the users, not throwing out what’s fun or cool from a tech perspective. Is there any way to make the Backup Tool also copy certain folders/files from /etc, such as /etc/apt, and specifically source.list, then when restoring, adjust all (or selectable) references to karmic or older versions to now be set to isadora? That way, all PPA’s and 3rd party repositories can be saved for the restore as well, and you won’t lose a thing. If the Backup Tool finds that a repository doesn’t have an isadora section yet, it will return it to the original setting or to karmic and try again. Just a suggestion, if it’s possible. Totally out of topic: I’m fearing the latest changes in Ubuntu (most specifically on Mono, but not only), I hope that Mint will someday (not too late) realize that Mono is not necessary. at. all. GoustiFruit: I understand the angst people have regarding Mono, and especially its relationship to Microsoft. That said, I personally have at least one program that I use occasionally that requires it (and there are no alternative programs). Plus, if it is yet another avenue for cross-platform programming, it can be useful. I personally don’t mind it. I think it’s easier to uninstall it (put “Mono” in a Synaptic quick search and delete all the Mono packages that come up as installed) than to install it (trying to figure out exactly which of the seemingly hundreds of packages that exist for Mono that you really need). So I don’t see the problem with including it. It’s akin to including WINE, Java and Flash. It’s just another way to add compatibility. I’m curious, what do you mean exactly by “Software Selection” and “Installed Applications”? Is it the applications that only the user have installed, or all packages including the ones installed by default on the system? I would love to be able to backup only the applications I have added to the system. Mark: Only the ones YOU added, not the ones that were there before, and not the dependencies that were installed automatically. Cool. I am using Mint 8 Xfce. I like it very much. Very fast I have ever thought. I must try this backup tool and write on my blog. advantages to be reaped by every-day users. Well… if the backup tool is capable of backing-up software selections it should also be capable of backing-up custom software repositories that got added after the Mint setup. Saving a few lines of text is by far easier than the rest of the tasks so this should be considered for the final revision that gets in Mint 9. That way people will be practically able to restore everything without having to remember where they got the software from. Kneekoo: This feature will be added, there’s no question about that. In practice we need to get ready for Isadora and at some stage we need to code-freeze. The feature you mention was taken out of the scope of this first release, to guarantee the tool would be functional and fully working for Linux Mint 9. There are a few things to consider when it comes to backing up repositories… and this isn’t something I wanted done in a hurry. @Clem: That’s awesome, I’ve been really wishing for something like that. I don’t think any other distro has it, it’s a great plus. I’m assuming that the tool will restore the newest available versions of the backed-up applications (software selection), and not the backed-up versions. I hope this is the case. Mark: Yes, it will install software using the new versions available in the repositories of the newly installed system. Say you install Filezilla in Linux Mint 6, save your software selection and restore it in a new Linux Mint 9, it’ll install the filezilla version that’s available for Linux Mint 9.
yes am aware is in testing and dev still, it’s the first big distro to implement this. anyway in later versions of mintbackup a similar experience could be possible for ext4 users. Hey ppl, i think that this a great step. But… i don’t want to offend anyone, and i repeat that i think that is a great idea this tool (and the tool itself). But aside from the sofware selection (which is great and VERY handy) the personal files can be done using Deja Dup. I mean, is a complete tool which have great options additionaly. Just that, maybe adding the ideas to deja dup will improve the efficiency of the backups for the user. Or maybe some ideas of Deja Dup can be included into the Backup Tool. And what about restoring my mint 5 system? how can I install this tool on Elyssa, in order to have averything in order in a freshly installed Mint9? Emidio: Follow the tutorial, as far as I can see this tool should work on Mint 5 as well. If you encounter any problem with it please raise a bug. Mint 5 is an LTS release, so from Mint 5 to Mint 9, we’ll assist anyone trying to upgrade. If there’s any problem with the tool in Linux Mint 5, we’ll have it fixed in no time. Thank you very much Clem. So, you suggest to format /home partition too (since I have it separate from /) -in ext4 of course- using mintbackup, do you? I have install the tool under Mint8,and found a Point by my test, which can lead to a problem, especially for beginners!. The Nautilus shows me 1.3 GB is the size of my Home folder, but due to the hidden folder of Virtualbox, I come to well over 10 GB!. So you can not save it to a FAT32 partition!. Because of these folders in Nautilus is not show by default, and in backup tool not show, the novice knows not why his backup fails! and think the backup tool is bad. Since the tool is running with root privileges,I think it would be good idea if you make possible that can also exclude hidden folders, or at least that the real size of the home directory is shown!. (And then perhaps also a warning like “The backup is too large to be stored on a FAT partition!”). Newcomers are the most frequently working with a Win partitions at the begin!. I hope you still understand what I care about. Great tool, thanks for hard working. looking forward for new Mint version. Sounds good..I’m looking forward to trying it. This is a great new tool. My question is: can this be integrated into the installation process so that a user can backup their files and settings during the install? I figure that it can be run from the Live CD, but was thinking it would be a great option to have during the install process. I did the old way of upgrading from Mint 5 LTS to Mint 8 due to issues with installing packages in 5, so I know how annoying backing up and restoring all the files and installed programs can be. This will be a great feature for making upgrades easier for novices like me. ThomW: Well, ideally yes. The problem when it comes to the installer is that it isn’t ours… we use Ubiquity. Now, we patch it quite a lot already but the more we do the more it gets hard to maintain and the more risks we take by doing so. Ultimately we should have our own installer, maybe that’s a case for Linux Mint 10, it’s too soon to say. We made an installer for Debian but it’s only in its infancy. Ubiquity is mature and full of nice features. We’ll need to take our time on this. If we put the time I’m sure we can do better. The question is, with an installer that already works pretty well and that is very well maintained by Ubuntu, should that be a priority for us? Does the tool come with a decent commandline interface? I have an automated backup script and would love to use bits and pieces of functionality offered by this new tool, but without the gui. Theo: No. There are a lot of commands available to achieve what this tool does graphically (rsync, tar, bzip2..etc), to a lesser extent the software selection can also be saved using dpkg. So we didn’t add a CLI interface to it at this stage. We can add one in the future depending on the demand from the community. It looks I miss something? Thank you, Ikey, for all your hard work. please let it have support for webcams that are self installing coz i have suffered for long with mine and yet on windows it runs well. Great tool clem, but would it be possible to view the software selection backup files outside of mintbackup, since I want to delete a couple I made in experimentation. I’m getting the same things as Emidio. Any ideas? I’m getting the same thing as Emdidio – nothing. Any help would be appreciated. Would it matter that I am running LM7 Gloria and not LM8 Helena? So…I guess I’ll just run it by command line until I upgrade to LM9. Then it should work fine once I’ve done a fresh install, right? Is there a way to make it run now via the Menu? You sounded like you had a revelation. Just curious what it was. Emidio, When I follow Clem’s instructions I get the following in my terminal window and it runs properly. Cut and paste his instructions so you know that you are doing it exactly right. Ok, I’ll make a version for Linux Mint 5.
dtw: I didn’t test it, but this is likely to work in Linux Mint 7. Let me know how you get on, don’t hesitate to report bugs on Launchpad so we can efficiently track them. I’ll be responsive when it comes to mintbackup as this tool is important for you to upgrade. wow. you guys rock so hard. Thanks, Clem. It backs up fine on LM7. Thanks, Clem. Working on my LM7 as well. So, that backup tool is going to be available for users when upgrading from Mint 8 to Mint 9? Because that would be completely awesome. Wow, thanks Clem, I received a nice update just 5 minutes ago….and it works! Just when I think mint can’t get any better….. it does. I am running a linux mint 8 helena on my laptop. I would like to backup all the installed packages and the data and restore it as an image in the new version once it is rolled out. Can you kindly guide me on how to take the backup of the data and the packages installed as I am new to linux. The upgrade difficulties associated with Linux have at last been artfully removed and make my recommending Mint to users of a certain other op system very much easier. I’d been restricted to suggesting Mint to those I could visit to assist with such matters, or those computer literate enough to figure out upgrade strategies for themselves. Remote desktops are fine in their own way, but getting concepts through using that facility can be a tad challenging. But this initiative literally changes the game. Many Many Thanks to Ikey and Clem – and others who’ve assisted. Will it be possible to use mintBackup in conjunction with aptoncd, for the purpose of reinstalling the same version of Mint?